United States Coast Guard agents are being kept busy, as massive packages of cannabis continue to wash up along beaches in the Florida Keys. United States Coast Guard agents are being kept busy, as massive packages of cannabis continue to wash up along beaches in the Florida Keys. While this isn’t an uncommon occurrence, agents have seen a spike in these cases over the last year, due in large part to the extermination of other entry points. As the cannabis seizing calls continue to flood in, beachgoers should be aware that they very likely could stumble upon one of these packages themselves. During the 1960’s and 1970’s, when cocaine smuggling was at an all-time high, it was not uncommon for smugglers traveling by boat, dumping their stashes into the ocean, either to avoid the prying eyes of authorities or for later pickup by American counterparts. However, as the drugs began finding easier, more reliable ways into the country, through tunnels and carries in the southwest, many of these boating routes dried up and the Coast Guard saw huge drops in distribution coming by way of the sea. Now, as cartel wars continue to plague much of Mexico, and with agents who are more skilled than ever at stopping drug trafficking, the Florida Coast Guard is seeing huge spikes in smugglers returning to old trade routes. Many of these routes are well known to authorities and are more heavily patrolled than other areas. Dumping the drugs into the ocean is still a common practice among these traffickers and, unfortunately for the cartels, their precious cargo is beginning to wash up on the beaches, primed and ready for seizing. Since the beginning of 2016, Florida Coast Guard agents have seized cannabis more than 95 times, up from the 49 reported cases last year. Aside from their active seizure efforts, officers are also seeing huge amounts of cannabis washing up on shore. 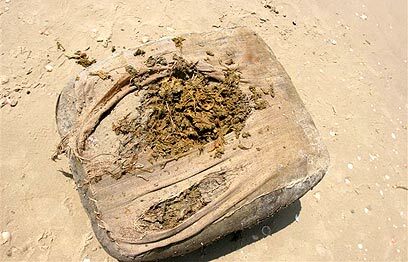 Most recently, a total of 15 packages, containing nearly 400 pounds of cannabis, have been found along various beaches. All the packages appear to have come from the same haul, but officials can’t be sure. The newly revived boat smuggling routes open up a passage from the Bahamas and Puerto Rico, two places that officials are positive are producing the illegal contraband. While it might seem like no big deal, these smuggling efforts have the potential to hinder legal markets from sprouting up in states in like Florida, where many residents will not vote to legalize because they simply don’t understand the difference between smuggled cannabis and legal cannabis. Many of them have been told about the dangers these smugglers present and, instead of taking the time to get educated, they choose to believe that legalization will only grow the cartels’ power and influence. If you find yourself strolling along a Florida beach and see suspicious boating activity or packages floating near the shoreline or on the shore, do not attempt to retrieve them. While it might make for a good story, it can also lead to serious jail time and be getting caught up in a cartel smuggling case. Instead, notify authorities or lifeguards, so proper action can be taken.